Culture Minister Regev tells architects of Beresheet project to land on the moon they will light a torch on Israel's Independence Day. Culture and Sports Minister Miri Regev, Chairman of the Ministerial Committee on Symbols and Ceremonies, informed Morris Kahn, philanthropist and president of SpaceIL and Kfir Damari, one of the founders of the Beresheet project, that they will light a torch ceremony marking the State of Israel's 71st Independence Day next month. "Morris Kahn and Kfir Damari belong to the team of dreamers who are successful in realizing their vision," Regev said The Beresheet project, which began as a distant dream, soared and came within reach of the moon. Their great spirit, creativity, and daring were the hot engine which launched the Beresheet project. Their great spirit was not broken, when Beresheet was unable to land completely on the moon." "That short distance from the moon gave them an additional tailwind, not to let go, to dare again and to succeed in the future. I believe that we will still be able to see Beresheet 2 reaching the moon and lighting our imagination. 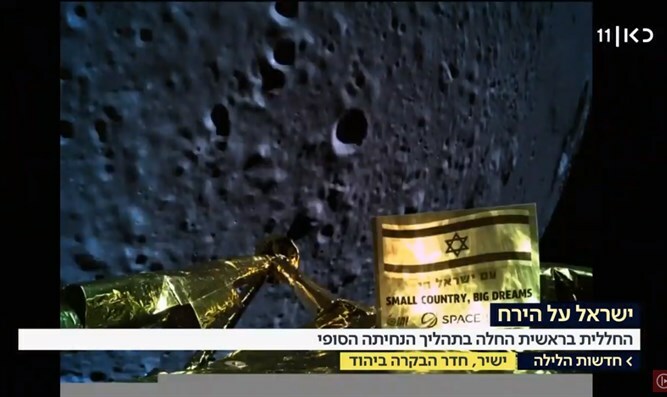 "Beresheet" was a giant step in the story of Israel, a small country with great dreams, which will be fulfilled also on the moon. Minister Regev accepted the recommendation of the public committee to choose the SpaceIL leaders as torch bearers. SpaceIL is an organization that has been working for eight years to promote scientific and technological education in Israel and to encourage Israeli innovation. Together with hundreds of volunteers and in partnership with government ministries and private organizations, the organization's education team has reached more than one million students in Israel and around the world to create the "Bereshit Effect" - to connect them to science and technology, to promote the next spaceships and to make sure they do not stop dreaming and fulfilling. The work of "Bereshit" inspired many Israelis and proved to Israeli scientists, inventors and thinkers that heaven, too, is not the limit, and that there is nothing to resist.